In the fermentation yeasts use only fermentable sugars, glucose, fructose, maltose and in some cases maltotriose as well, to produce ethanol. The control of the residual fermentable sugars allows to attest the end of the fermentation and possibly dose the further addition of sugars for a second fermentation in bottle. The analysis of the fermentable sugars is also a very good parameter to determine the fermentative potential of the wort and so the potential alcohol content. With CDR BeerLab® systems is possible to analyze this parameter in wort and in beer in few minutes. The analysis does not require skilled staff, laboratory glassware nor preparation of reagents: thanks to the instrument and to the optimization of the reference method correlated with it, the analysis is reliable and easy to perform directly in brewery. 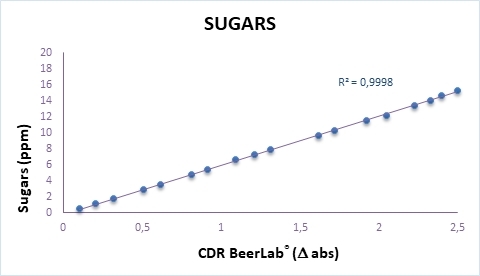 Fermentable Sugars can be measured using CDR BeerLab®, a system which enables you to carry out a wide panel of chemical analyses on beer and water, using a single instrument, in a process that is faster and simpler than traditional methods. The sugars present in the sample are determined through an enzymatic method. The redox reaction is read in end point at 366 nm and the value is proportional to the concentration of fermentable sugars in the sample. Code *300640 – The kit, designed for 100 tests, comprises. Code *300645 – The kit, designed for 10 tests, comprises. Beer: The beer sample needs to be degassed (we recommend to use an ultrasonic bath) before taking the sample. Wort: Dilute the sample 1:20. For higher accuracy in the analysis of wort we recommend to centrifuge the sample. Fermentable Sugars was last modified: February 19th, 2019 by CDR s.r.l.